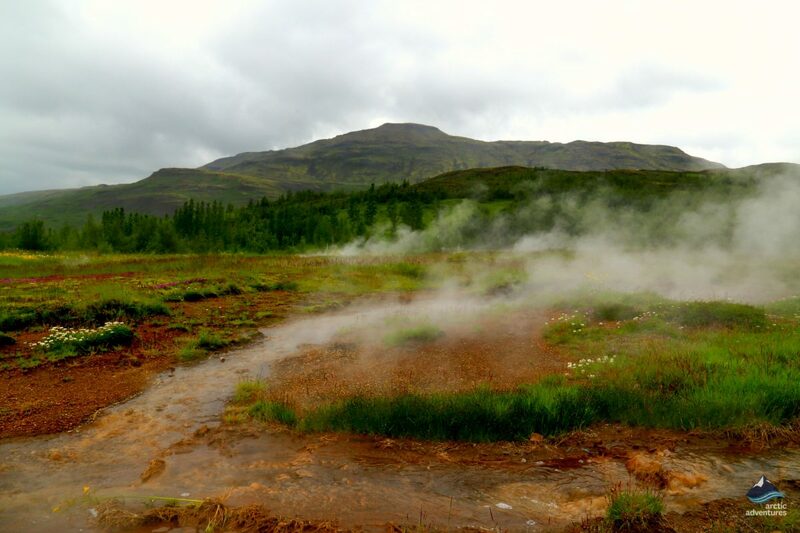 Haukadalur Valley is home to the famous Great Geysir which gave its name to the phenomenon, geyser, world-wide! Geysir has in recent years stopped erupting but his baby brother Strokkur now puts up a magical show every 4-10 minutes creating an instant wow-choir in the crowd resent. Watching a geyser erupt is one of the best experiences to have in Iceland and shouldn’t be missed by anyone visiting the island. 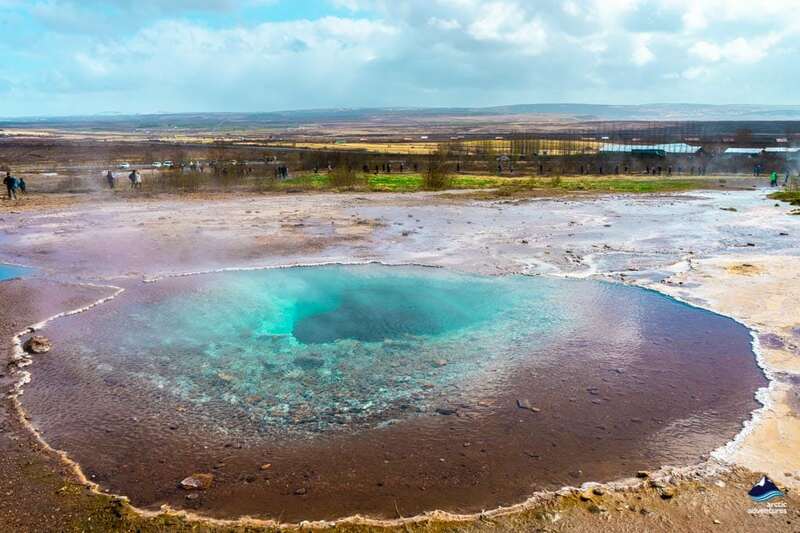 Where are Geysir and Strokkur Located? 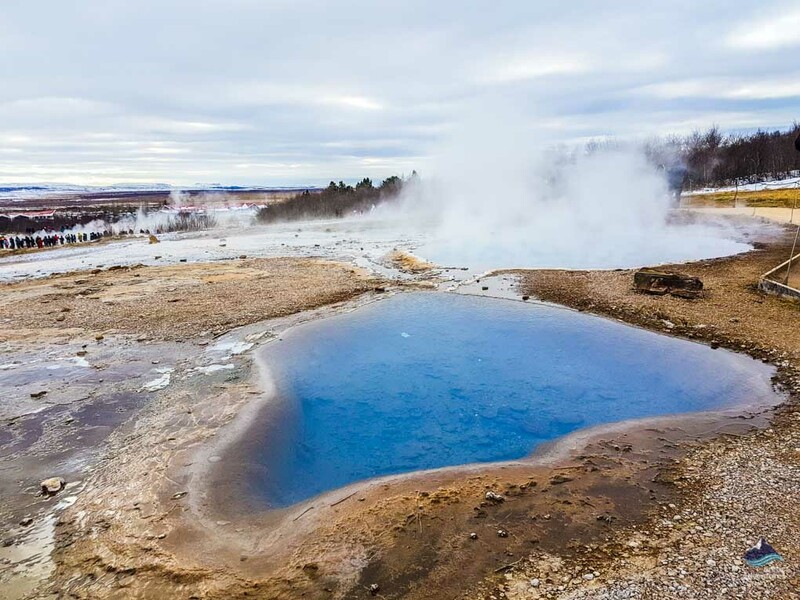 How to get to Geysir and Strokkur? 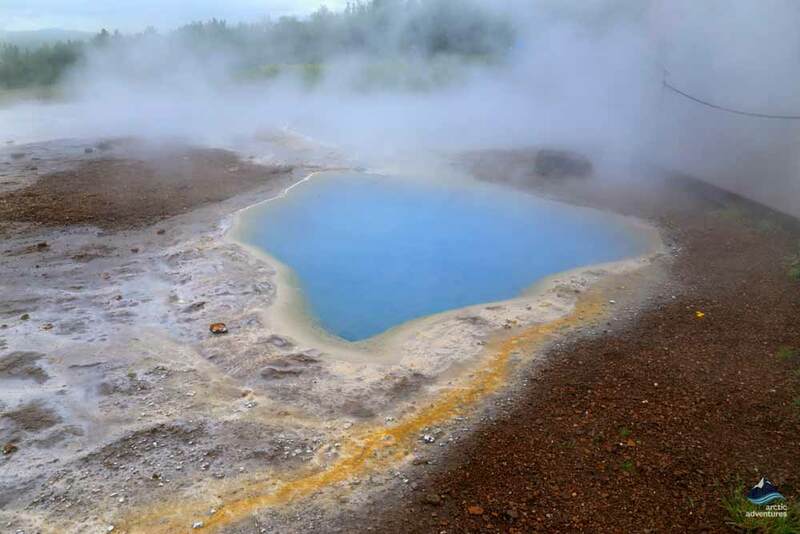 What not to do at Geysir and Strokkur? Geysir in Haukadalur is most likely the most famous geyser in the whole wide world, it is after all the one all the other geysers are named after. Geysers are a rare phenomenon and knowledge about them is quite limited. They were almost an unknown thing in the Western world until the 19th century. The geysers in Haukadalur were first mentioned in literature in the year 1294 but that year enormous earthquakes shook the grounds which both created new geysers and ruined some geysers already in the area. 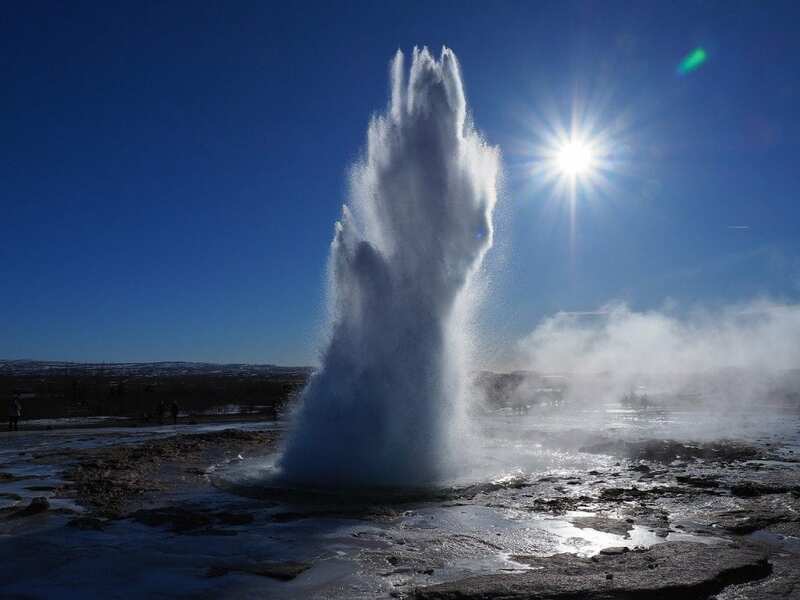 Earthquakes have been known to restart Geysir’s activity but in the year 1630 an earthquake woke Geysir up after 40 years of hibernation and the eruption was so powerful it shook the surrounding ground. This happened around the time Geysir started getting famous and travelers and explorers made their way from all over to witness its eruptions. 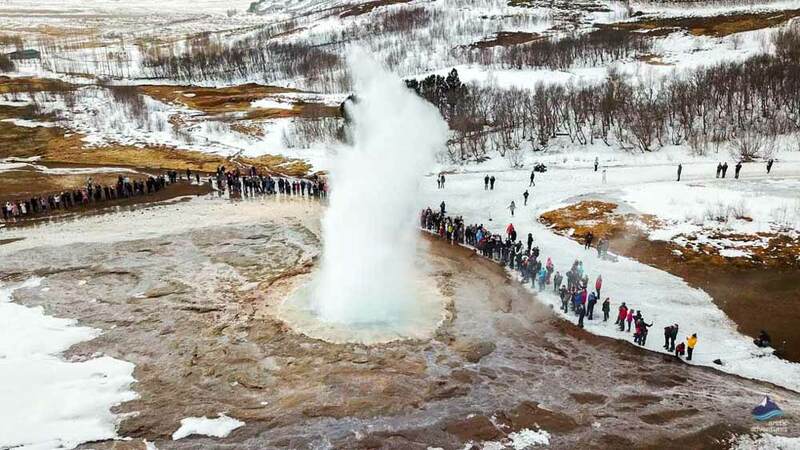 The name Geysir can first be found in literature from the 18th century, there described as an unusual natural phenomenon which, at this time, was already of great interest. 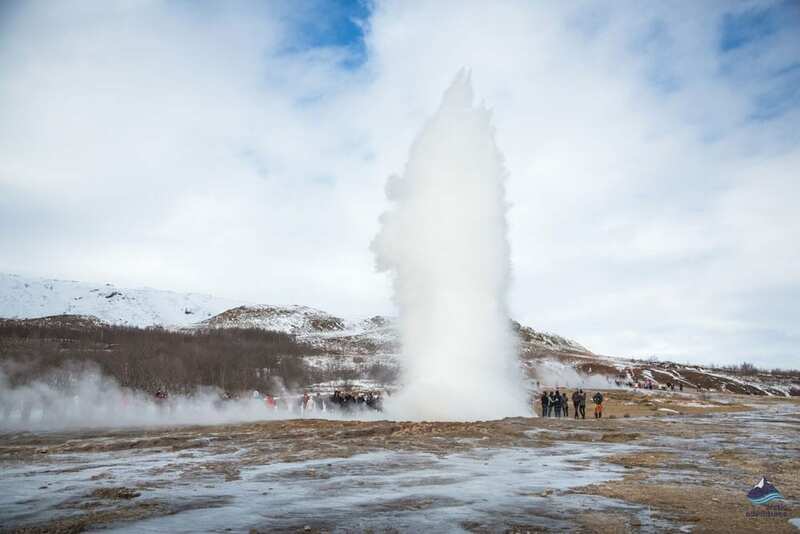 In the year 1845, Geysir would erupt up to 170 meters (557,7 ft) into the air but a year later it was only reaching the height of about 43-54 meters (141-177 ft). Subsequently, it went almost dormant until the year 1896 when another earthquake revived the beast which as a result would erupt multiple times a day, sometimes lasting up to an hour each time and going up to 60 meters (196,8 ft) in height. In 1910 Geysir erupted every 30 minutes but five years later the time between the eruptions was six hours. A year later the eruptions had ceased. 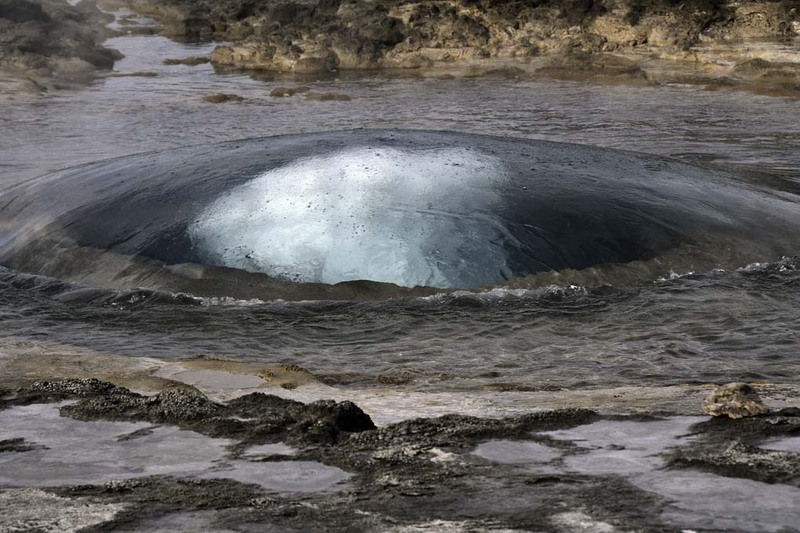 In the year 1935, a man-made channel was dug from the geyser causing a shift in the water level and causing it to erupt again. With time, the channel leading from the geyser became too clogged with silica and the eruptions became rarer. In 1981 the eruption was forced again but this time soap was used to do the job! In the 90’s, due to environmental concerns, the soap trick practices less and less but the government authorized for geologists to do it especially for Iceland’s National Day, the 17th of June. 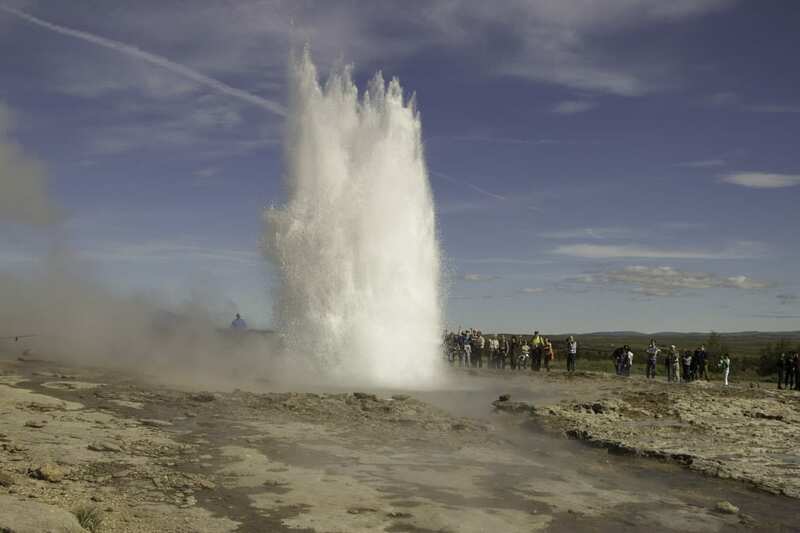 The geyser was greatly affected by an earthquake again in 2000 and the eruptions reached up to 122 meters (400 ft) height and even lasted for two days. This made Geysir one of the highest geysers ever in history. Only Waimangu Geyser in New Zealand erupted higher reaching up to 460 meters (1,509 ft) in height but it stopped erupting around 1900. From 2000 the eruptions were around eight times a day but in July 2003, the activity had decreased down to three times a day. Today Geysirs activity is very low but who knows when it will decide to erupt again, maybe you’ll get to witness it! Strokkur geyser is the most active geyser in Iceland and erupts naturally every 4-10 minutes, it usually erupts up to 15 or 20 meters (49-65,6 ft) but in history books, you can find accounts of it having gone up to 40 meters (131 ft). 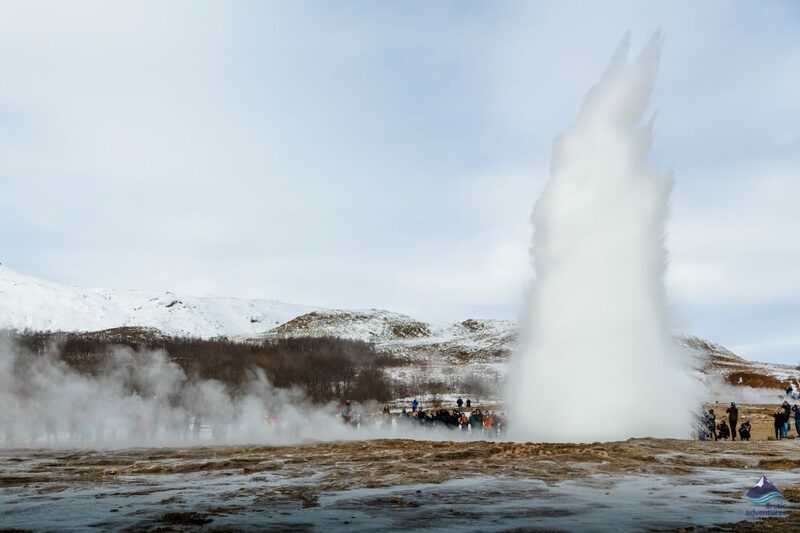 Strokkur and Geysir are believed to be the same age but since Geysir was considered to be the more magnificent Strokkur wasn’t mentioned in any written books until the year 1789 after an earthquake helped to unblock the conduit of the geyser. In 1815 Strokkur’s height is believed to have been up to 60 meters (196,8 ft). In the 20th century, yet another earthquake clogged the conduit again. 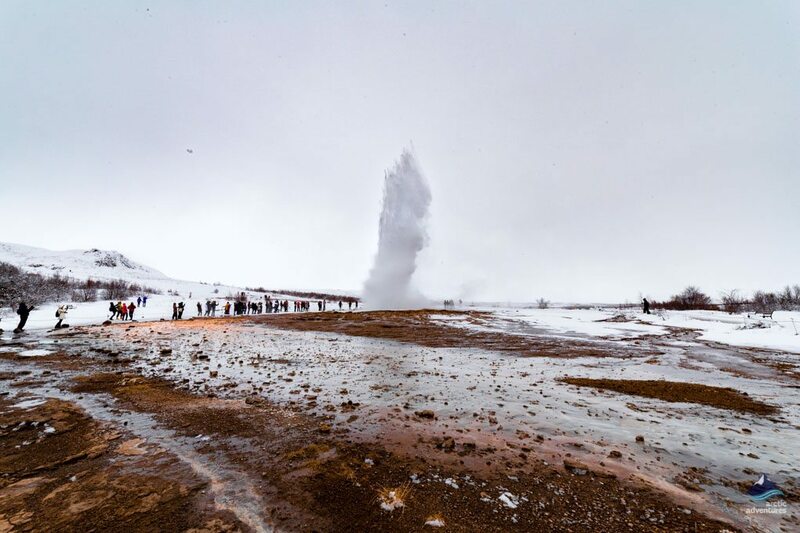 In the year 1963, the locals cleaned out the conduit again and ever since Strokkur has been erupting rhythmically like a rocket into the Icelandic sky! The sight of Strokkur erupting is both unique and special. The experience of standing in anticipation with your excitement rises, then sensing the subtle signs which herald Strokkur imminent eruption is also not to be underestimated. The geysers are one of the attractions of the famous Golden Circle. Situated in the geothermally active valley of Haukadalur in South Iceland 99.2 km (61,6 mi) from Reykjavík if you take the Þingvallavegur route, otherwise around 107 km (66,4 mi). 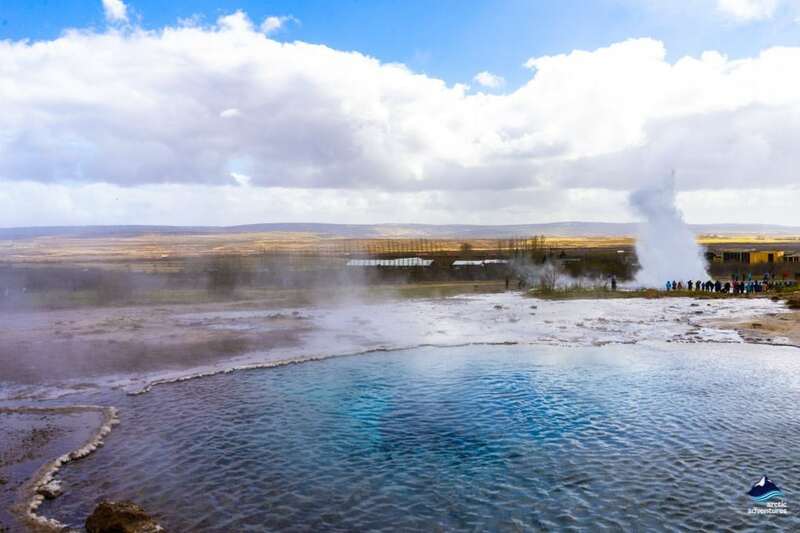 The Geysir hot spring area is easily accessible, it is located on road nr. 35 is open almost 365 days out of the year. Driving from Reykjavík to Geysir you can take two routes. The more common one is through Mosfellsdalur, past Thingvellir National Park following road number 36. The road soon switched to road 365 and as you pass Lake Laugarvatn it turns to road 37. Continue on this road without any turns and you will soon start noticing some geothermal feature, smoke and possibly even a geyser eruption. The second way, which many also like to take on the way back, making the drive an actual circle, is via road 1. It takes you through Hveragerði and right before you reach the town of Selfoss you make a turn left onwards to Lake Laugarvatn. This route will take you past Kerið Volcanic Crater, Skálholt historical site, Faxi waterfall as you follow road 35 all the way there. 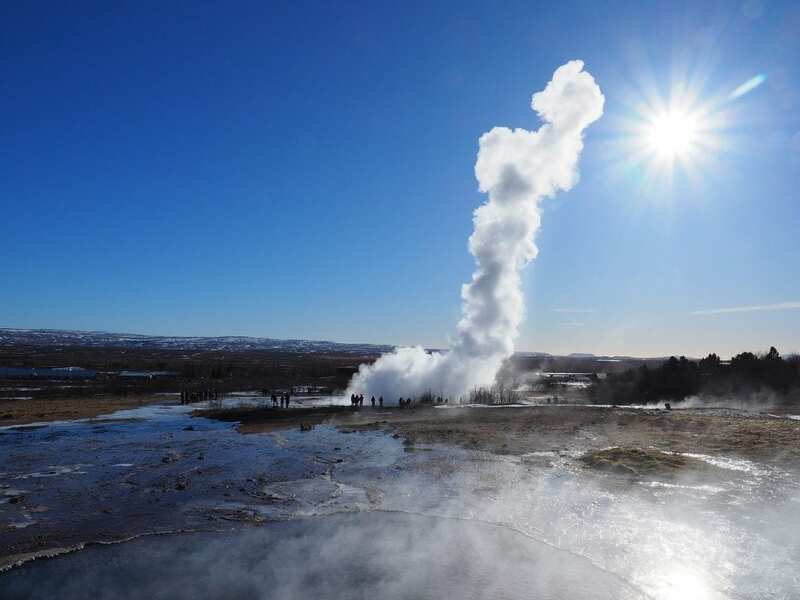 At the Geysir location, just across the street from the mighty geysers, you will find two hotels and a cottage so finding accommodation should not be a problem. 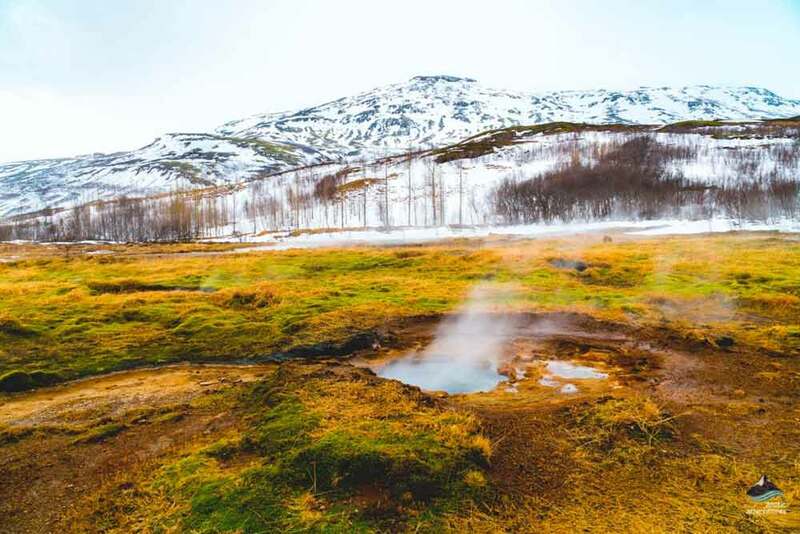 If you wish to stay away from the Geysir area, to possibly find more tranquility and less traffic, we will also mention cabins and other options further away. 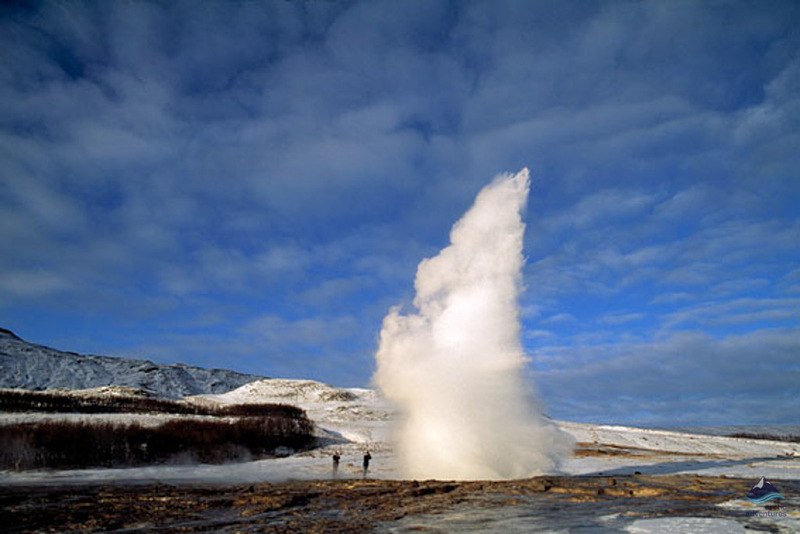 The top options are the closest ones to Geysir. 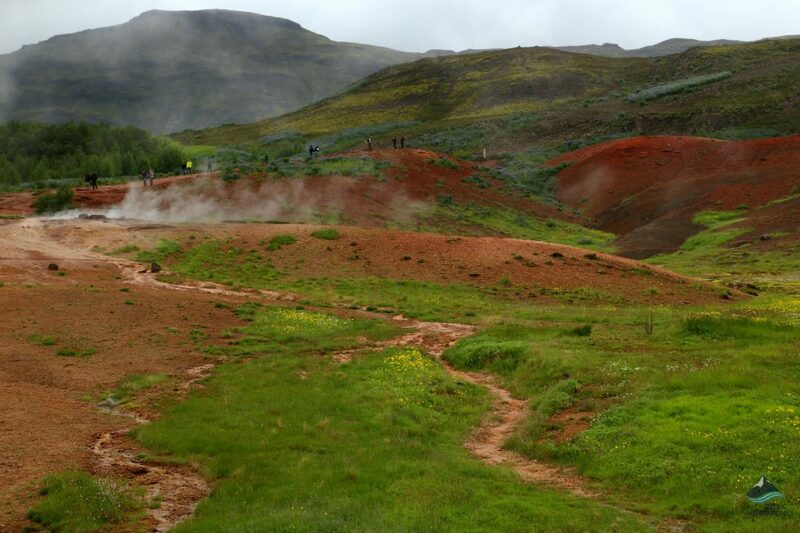 Geysir Camping Ground is located within a walking distance from Geysir. Facilities on site include showers (500 ISK), WCs, access to electricity (900 ISK), washing machines, WIFI, a golf course, and a playground. Open from the 15th of May till the 15th of September. Skjól Camping Ground is located in between Gullfoss and Geysir. Their facilities include a restaurant, showers, WCs, WIFI, washing machines (400 ISK), access to electricity (900 ISK), a restaurant, a golf course, walking paths, and wheelchair accessibility. The price is 1200 ISK per adult per night. Faxi Camping Ground is a quiet and beautiful location next to the waterfall Faxi. The facilities include cooking facilities, electricity (1200 ISK), WCs, showers, a swimming pool, a restaurant, and walking paths. Open from the 15th of May till the 30th of September. Úthlíð Camping Ground a charming camping sight near Geysir. Facilities include cooking facilities, WCs, showers, electricity (1000 ISK), a golf course, playground, and a swimming pool. The price is 1500 ISK per adult per night. Open from May to September but all year round for campers. 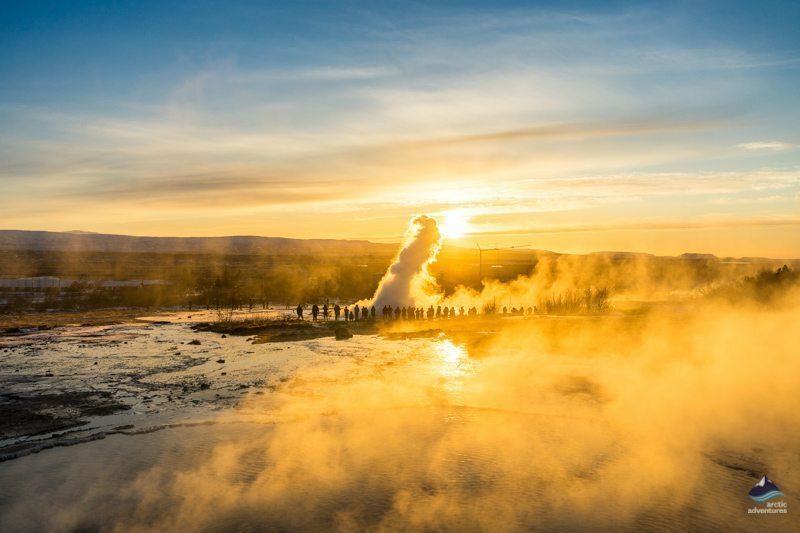 Visiting Geysir doesn’t cost a thing! There is a nice restaurant/cafeteria located on site. Gullfoss waterfall is only about 10 min drive away. Don’t worry if Strokkur just went off the minute you parked, it will go off again in about 10 minutes. 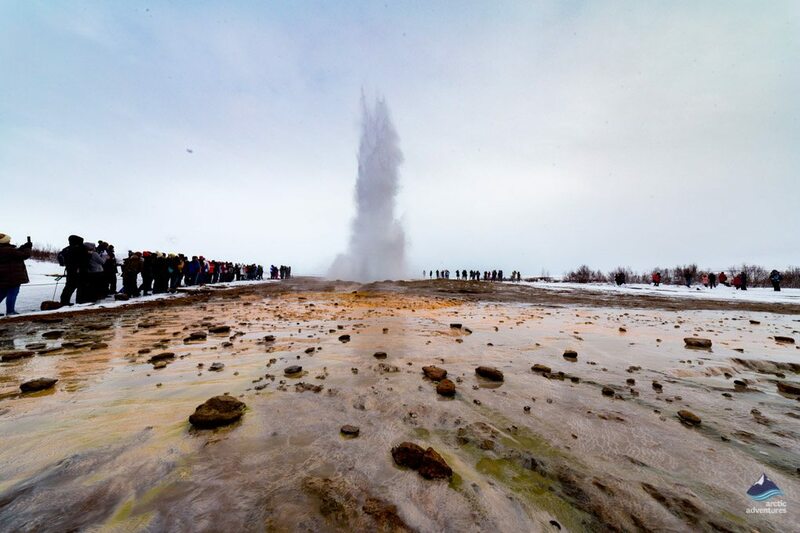 Geysir is one of the three stops that makeup the Golden Circle, you can join a Golden Circle Tour to visit! Is Geysir active? When did Geysir last erupt? Strokkur hadn’t erupted since the year 2000 before a suddenly bursting up into the air in February 2016. This shows you that it is still active although not at on frequent level. 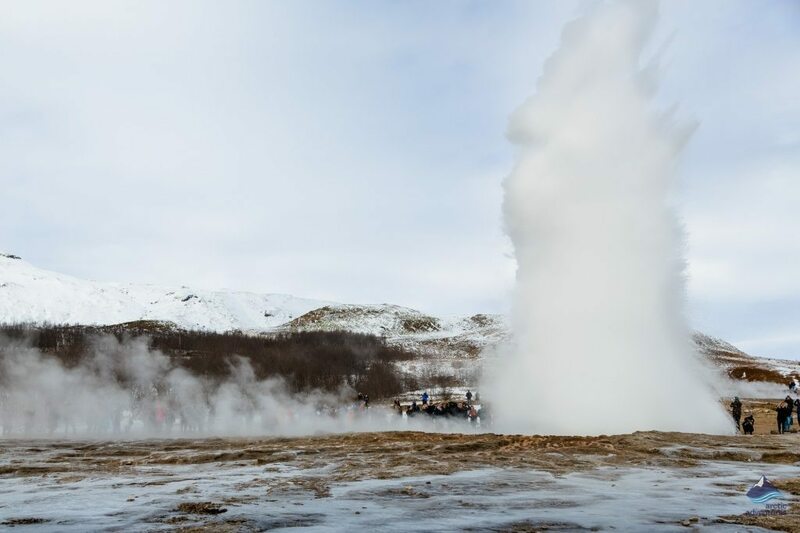 Can you bath in Geysir or Strokkur? No, absolutely not! The temperature is anything from 85°c to 120°c. 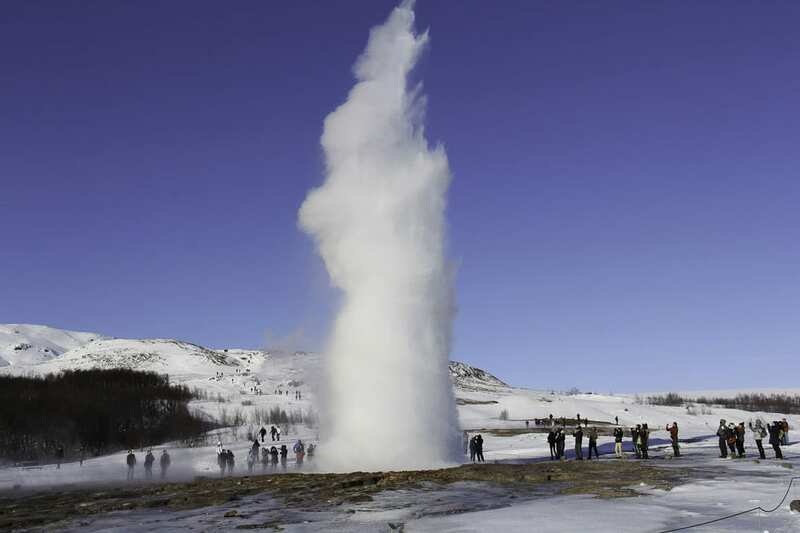 Is there a place to eat at Geysir? There are great restaurant options both at Geysir in Geysisstofa and at Súpa and also at neighboring attractions and farms (Við Faxa, Efstidalur II, Lindin, Friðheimar andHéraðsskólinn Restaurant and Bistro). What are the eruption times of Strokkur? Strokkur erupts every 4-10 minutes, on a rare occasion you might have to wait 15 minutes between eruptions. The force of each burst can though vary quite a lot so you might need to watch a couple to get a high one. 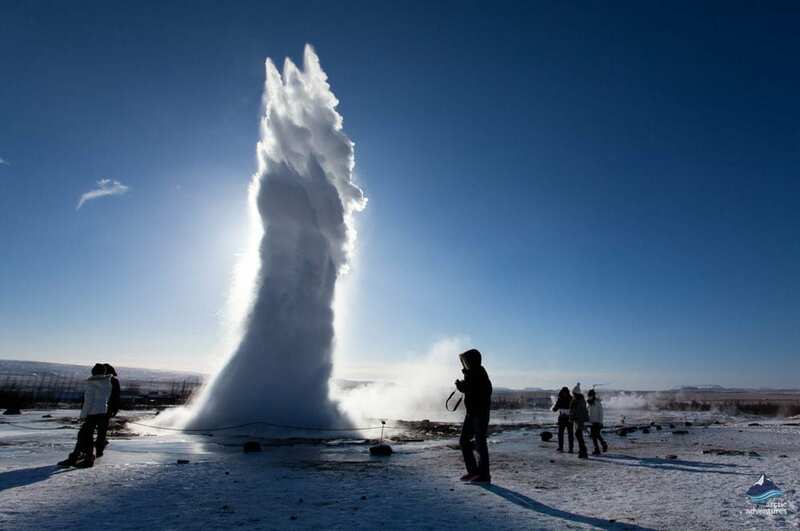 The Geysir area is a fascinating attraction any season, all year round. The steam and smoke that surrounds the area takes on the otherwise frosty atmosphere and a true collision of ice and fire takes place. The ground can still, get quite slippery so it is important to walk around mindful of your step. 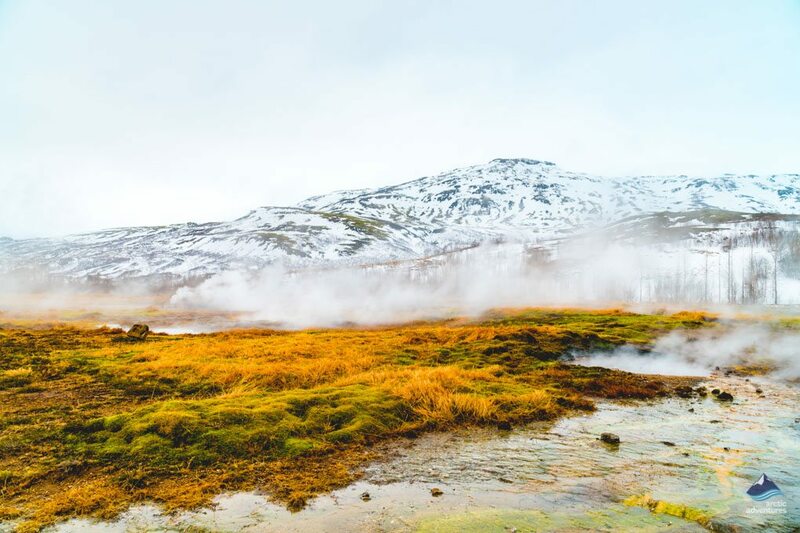 Keep in mind that even when visiting a geothermal area such as this one the temperatures aren’t high so you need to dress according to weather forecasts. Dress smart – Layers is key! Go within the lines! The water is extremely hot and the lines have been put up after accidents have happened. Follow the rules, there is a reason for them. Go there without visiting Gullfoss, the waterfall is only about 7 min driving distance away. You simply can’t visit the area and skip Gullfoss. Litter! The area is greatly kept and it’s important that we do what we can to help to keep it that way.